9/11 Commission Report Confirms Moore's Lack of Credentials! The Facts in 'Fahrenheit 9/11' Unanimously Dismissed! Check it out for yourself, if you like. Visit http://www.michaelmoore.com. I'll give you some time to look. ......See? It's a real website, and it's indeed the official website for the filmmaker. Wait, what's that? Those headlines aren't on the website? Well, they most certainly are--in a sense. Okay, the truth is, I didn't like the headlines as they were listed, so I changed them around a bit. The words 'Unanimously Dismissed' were pulled from a smaller headline further on down the page. And as for 'Moore's Lack of Credentials'? Well, that's the result of several creative cuts & pastes. But every single letter in my headlines came from Moore's front page. I apologize. How horrible am I to use Michael Moore's own written words against him? To chop sentences up into tiny little pieces and rearrange them? To support my arguments with a manipulated form of a legitimate, documented publication? Shame on me, yes, shame on me. "BLOOMINGTON, Ill. Aug. 12, 2004 - Filmmaker Michael Moore makes no apologizes for his Bush-bashing documentary "Fahrenheit 9/11," and his lawyer says he'll make no apologies for its use of an Illinois newspaper headline, either. 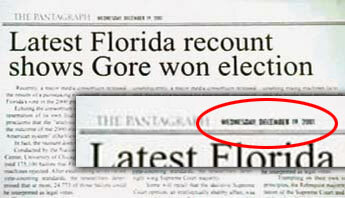 Westside Productions lawyer Devereux Chatillon acknowledged that Moore was two weeks off on the date of the headline, which read: "Latest Florida recount shows Gore won election." But the mistake "did not make a difference to the editorial point ... and was in no way detrimental to (The Pantagraph)," the New York-based attorney wrote in a letter to the paper." (ABCNEWS.com, from an Associated Press article. Apparently, Michael Moore and his team of lawyers know nothing of journalistic integrity. The changed headline may have not made a difference "to the editorial point", but it certainly made a difference as to how audience may perceive the Pantagraph's own position. (Last time I checked, a letter to the editor is written by a reader, not by anyone who dictates the newspaper's policies.) I am appalled. Allow me to provide some background about myself... I run a movie review website: Smart-Popcorn.com. "Online press" have a bad reputation--in fact, it's almost impossible for us to acquire access to press screenings of movies, so in order to be taken seriously, we must ourselves take things very seriously. Things like journalistic integrity, prior written consent, temporary gag orders and other studio requests. I can tell you, from my own experience, that if Michael Moore handled a movie review website like he handles his films, he'd have to pay for his own tickets as he'd be among the many DENIED access. There's another angle to all this: I'm also an aspiring filmmaker. While I intend to create feature films, I would very much enjoy documentary work and have a deeply held respect for the history and integrity of documentary filmmaking. Moore has no such respect. Most documentaries are made (and viewed) with the assumption that the filmmaker has a far greater knowledge on the subject than an average viewer. Because of the filmmaker's expertise, a viewer must be able to feel that he/she trusts the filmmaker, and that the filmmaker is providing a balanced--if not exhaustive--cross-section of the facts at hand. Most documentaries respect this rule, and these docs are not just the sleepers you can find late at night on the Discovery channel. Metallica: Some Kind of Monster, by Berlinger & Sinofsky, showing in limited release in theatres, does a great job of showing different sides to each of its subjects. However, Moore and a few other filmmakers have begun to popularize a different type of "documentary", one that amounts to little more than propaganda. The American Heritage dictionary defines propaganda as "The systematic propagation of a doctrine or cause or of information reflecting the views and interests of those advocating such a doctrine or cause." Do most filmmakers have a cause behind their projects? Of course. Most documentary films are born from the passions of their makers. But respectable documentarians advocate a quest for resolute truth, truth that transcends their personal bias. Moore does the opposite: his personal cause, whatever it may be, is foremost on his mind, and he uses snippets of truth, along with clever editing and baseless insinuation, to make his points. I do not wish to debate the accuracy of his films... There are countless people who have done so already. Nor do I wish to defend Bush's actions regarding 9/11, Al Queda, or Iraq. I'm an undecided voter unhappy with both main candidates. I simply wish to create awareness about Moore's deceitful behavior, and the manipulative tactics he uses in his film. I urge you to research Moore's films and the flaws. There are numerous sites dedicated to this... Check them out, and if you must, rent his films and keep your finger on the pause button. (Even without research, many of his editorial tricks should be obvous to a movie buff or film scholar.) But please, please, DO NOT watch his films and assume that all of his "facts" are true. Please do not cast your vote based on Fahrenheit 9/11... Research the REAL facts, even if they lead you to the same conclusion. Above all, I urge you for the sakes of filmmaking and journalism, do not accept any more of this behavior from Michael Moore. We need fewer lies, not Moore lies.